Just weeks after 200 rescued hens were flown in from California, Catskill Animal Sanctuary (CAS) is once again at the center of a large avian rescue. This time, CAS welcomed nearly 30 turkeys from Staten Island to their new home in the Hudson Valley. The New York State Department of Environmental Conservation (DEC) has been monitoring the turkeys since they were found on the grounds of South Beach Psychiatric Center over a decade ago. Finding appropriate shelter for the turkeys has been complicated. 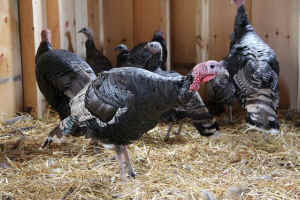 While the original birds were part of an abandoned domestic flock, the turkeys have since interbred with local wild turkeys, making the current flock hybrids, neither fully wild nor domestic. The turkeys are beloved by Staten Islanders who have fed the flock for years; they no longer have the instincts necessary to survive in the wild. Earlier this summer, South Beach Psychiatric Center declared the turkeys to be a nuisance and contracted the USDA to remove the birds. An initial round-up resulted both in the slaughter of turkeys and the convergence of animal welfare protesters on Staten Island. A coalition of groups who often find themselves on opposite sides of animal issues came together to create a happy ending for the turkeys. The Humane Society of the United States (HSUS) worked tirelessly with the USDA and DEC to coordinate a relocation of the birds. The DEC conducted a formal a walkthrough of CAS and declared the Saugerties sanctuary asuitable home. Goosewatch NYC secured funding for the construction of a turkey barn and as the terrified birds were taken into the safety of their new home, the final shingles were being nailed onto the roof. The cost of caring for the rescued residents at Catskill Animal Sanctuary requires a steady stream of donations and we depend on compassionate supporters to sustain our critical work. 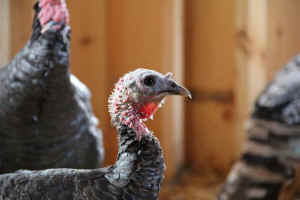 Please consider making a contribution to our Emergency Rescue Fund so that we can continue to rescue innocent animals like these deserving turkeys.